If it’s one thing that we can count on Cardi B to do, it is speak her mind and to not let anyone get in between her shmoney (insert Cardi B laugh sound bite), especially those of the male species. Cardi has previously vocalized her sentiments us about not allowing a man to get in the way of her dreams when speaking about her current incarcerated boyfriend, Tommy. It seems like Cardi couldn’t hold her tongue in this clip of Part 2. of the Love and Hip Hop Reunion show after Amina dropped a bomb in the form of a pregnancy announcement (yet again) while joined by her husband / second time around baby father and baby-mother in law/ sister wife Tara. Cardi, much like many of the respectable viewers at home, can no longer stomach this back and fourth tennis match that is Peter Gunz dabbling in sexual relations with these two women and them quite frankly allowing it to happen. The conversation, from what we can see started with Peter making comments about a woman being a hoe if she expects material things and money from men (specifically womanizers like himself Im assuming) . Cardi quickly flipped the script on Peter and we could clearly tell that he was feeling a way. “Why can’t I get something back? Look what you gave Amina and Tara…BABIES…That’s it.” Cardi began to imply that Peter is the type of dude that needs to get used by women because quite frankly he’s just a mess and is good for nothing else. I’m not one for promoting anyone deserving to get used (Karma will handle them), but Cardi’s shady speech got me to thinking a lot about the effects that men like Peter (straight up womanizers) have on the women in their lives and their children, specifically their daughters. People could joke all day about Tara and Amina being sister wives, but Cardi is exactly right about. Tara is incredibly smart women, even though she is a bit dumb for Peter; that isn’t a secret and can be easily seen in the way that she articulates herself. Amina, as Cardi pointed out, is incredibly talented (I personally love one of her first songs that played on LHHNY seasons before) but how often do we get to see what Amina is up to with her music? Never. Instead of seeing these women displaying their talents and achievements on this platform, their storyline becomes them being wasted potential, fighting for the love and attention of a man who hasn’t even fully grown up. Simply put, my papa was is a rolling stone. 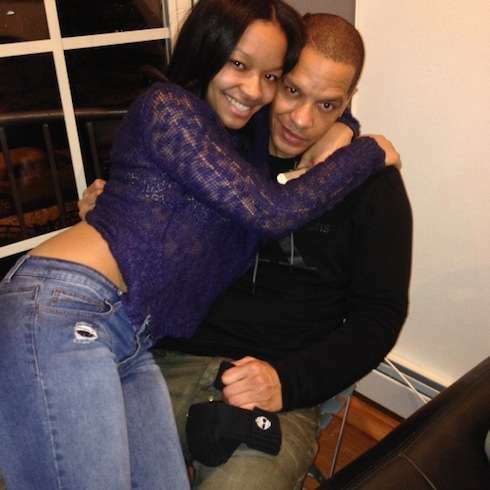 As a daughter of someone who is much like Peter Gunz, I instantly connected with his daughter Whitney crying out for her daddy to do better. Sad, but thats reality. It’s sort of an embarrassment to have a father that thinks playing with women hearts and minds is just a game of chess; like having kids that you may or may not take care of is something that is okay to do. It absolutely is not. When you are the product of this type of dynamic, you often find yourself between a rock in a hard place; you have a tad bit of resentment for your dad because of how you seen him treat women (you too are a woman) and the strain it has put on relationships with your siblings but you still love him at the end of the day because he’s your dad and he’s the first man that you’ve ever loved. This sort of behaviors of course effects the women (baby mama’s etc) emotionally but it also puts them in positions that they never ask for or aren’t deserving of, such as single motherhood. The children don’t understand why daddy wasn’t there and long for the companionship of their siblings that they only know from a distance (in addition to their fathers). The sons need their father to be there to teach them things that no matter how hard a woman tries, only a man can. The daughters more often than not have issues with developing romantic relationships with men because they grew up seeing their fathers doing all of the bad thing to women that a daughter, as a woman, fears a man will one day do to her. As played out of TV, Tara and Amina’s situation is presented as ratchet comedy but it all honestly it really is something that is very serious and effect people tremendously. Though I’m sure men of all races and ethnicities have womanizing capabilities, it somewhat has prominence in the black community and in a weird way seems to be more normalized day by day. Feel however you like about Cardi but so many things that comes out of her mouth is real on another level, this topic being one of them. If you checked out the sneak preview of next weeks Love & Hip Hop Reunion Show, what were your thoughts about what Cardi had to say to Peter? I cannot wait to see the conversation leading up to Cardi B putting Peter Gunz all the way in his place. The situation that the two women are in is shameful and it seems like a dysfunctional competition between them for the affection of a man who could care less about the well being of either of them. As comical as Cardi B is there is always a sense of “common sense” that rings from her.